FX’s Archer TV series has consistently been one of TV’s funniest animated series, finding humor in the espionage lifestyle without shying away from the darkness of the spy genre. Neal Holman’s experience as a producer and art director on Archer has given him a deep understanding of that balance of light and dark, and he brings that dynamic to science fiction with his new Oni Press series Redline, taking readers to a human colony on Mars under siege by local aliens (or is it?). 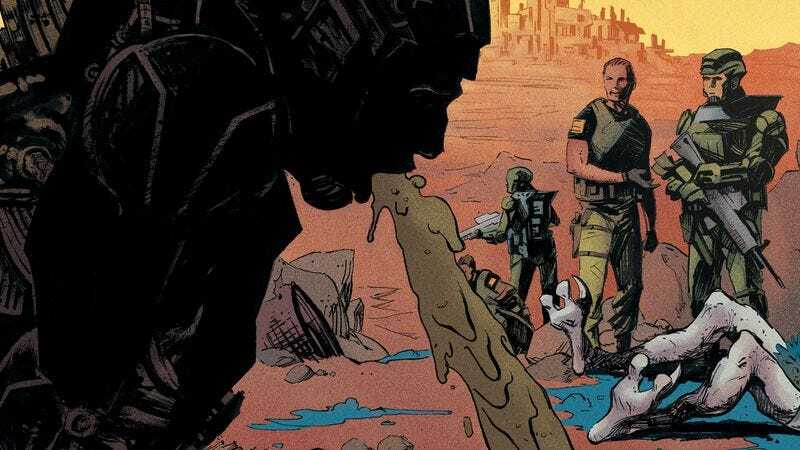 Written by Holman with art by Clayton McCormack and colorist Kelly Fitzpatrick, Redline begins with the bombing of Harrison Station, a tragic event that sets the stage for in-fighting between the local military force and the mining company looking to profit on Mars. This tension provides the cutting comedic banter that will be immediately recognizable to Archer fans, but the Mars setting and fraught circumstances bring extra spectacle and drama to the proceedings. What really sets Redline apart from Archer is the art, and Clayton McCormack’s linework has much more variation and texture than the minimalist animation of the cartoon. This preview of next week’s Redline #1 highlights the impressive detail in McCormack’s visuals, from the environment and character designs to the composition of his panels and layouts of his pages, drawing readers deep into this setting and bringing a lot of expression to the cast. Kelly Fitzpatrick’s coloring amplifies the texture of the lines with grainy rendering that reinforces the dry, sandy climate, and her palette of hot reds, yellows, and orange adds intensity to the story while setting a point of contrast for the bright blue alien that contains the bomb that sets the story in motion. Readers can uncover the mystery behind the attack when Redline #1 goes on sale on March 8, but in the meanwhile, here’s an exclusive look at the opening nine pages.